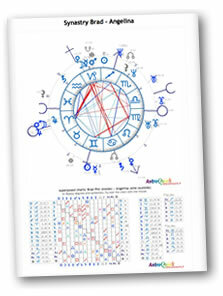 This document is an astrological interpretation of the comparison of charts for a couple. This study of the compatibility in a relationship is based on the analysis of the positions of planets and houses in each natal chart. This comparison uses several parameters into account, such as the positions in sign of personal planets, the positions in compared houses and planetary interaspects. This powerful synastry will give you some key elements in order to get better in touch with your affinities, your complementarities or eventually incompatibilities in your relationship. This astrological study of about 15 to 25 pages includes all natal and composite charts in color. starting from only 4177 JP ¥, including natal and composite charts !